Font freaks and bike geeks can flash the emblems of their allegiance—while keeping their pants up—with Steel Toe Studios’ hand-forged belt buckles. Made from repurposed letterpress blocks and bicycle gears, the steel and pewter pieces transmit a cool, industrial vibe without trying too hard. Slip one on your own trouser-cincher or purchase Steel Toe Studio’s recycled bike-tube belt to keep your pants from drifting south of the border. 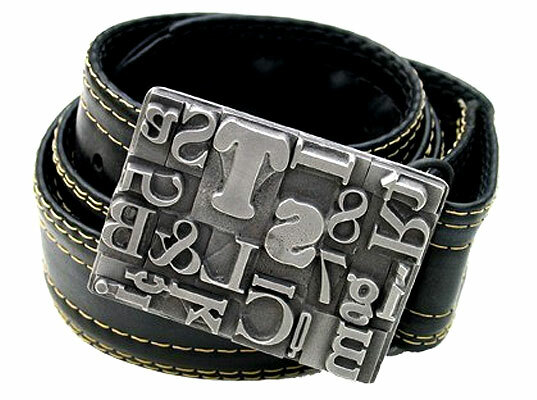 Font freaks and bike geeks can flash the emblems of their allegiance�while keeping their pants up�with Steel Toe Studios' hand-forged belt buckles. Made from repurposed letterpress blocks and bicycle gears, the steel and pewter pieces transmit a cool, industrial vibe without trying too hard. Slip one on your own trouser-cincher or purchase Steel Toe Studio's recycled bike-tube belt to keep your pants from drifting south of the border.